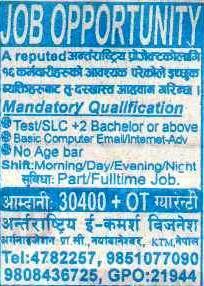 Earn 30400 per Month:Qualification SLC and above: Believe It or Not! When you visit their office they convince you that you can really earn this much of money. After that they ask you to fill up the form which may cost Rs 100 or more than that and tell you that you need to do training of some day which may cost 1000, 2000 or more than that also. And many of them agree to do the training because of the greediness of earning lots of money. In training they create a blog for you which can be created for free a cost for http://www.blogger.com/. After that they ask you to publish some articles on the blog and suggest you to submit your blog in different blog directory submission sites (when you search in google you will get thousands of such sites). Then they apply your blog for Google AdSense Program ( It's the program where you will have to publish google ads on your blog and when someone click on the ads then you will get some buck from it) or other sites which pay you for the click done by the visitor on the ads. They suggest you to put lots of ads on the blog which makes it so much ugly. But as they say its not easy to get approved from Google AdSense Program. And if you got approved from other sites then also you need thousands of daily visitors on your blog to earn that much money. And getting thousands of daily visitors is not a easy task. Because there are thousands of quality blog in the world, then why should someone see the blog that contains only ads. So i suggest you that if you are thinking of visiting such type of office then please don't do that. If you have knowledge about Internet then you can train yourself. There are lots of sites which provide such tips for blogging. You don't need to visit such office and pay money for such training. So first visit those sites, know more about blogs and blogging. Then create a blog from http://www.blogger.com/. Try to publish unique and quality post. I recommend you to buy your own domain name(eg:- http://www.gulmiresunga.com/ is more effective than http://www.gulmiresunga.blogspot.com/ ).Buying domain name doesn't cost more. It only cost less than 1000 per year.At least post more than 4 post every week. Wait for some months and when your blog gets popular and get more traffic then you can apply for Google AdSense Program. If you have any question then feel free to ask me. Please use blogger comment box (not facebook comment box) to ask me the question. put a new spin on a subject that's been written about for a long time. Great stuff, just excellent! Why is my blogbdisapproved by Google adsense? What is you blog url. 1. Very less and short content. 3. Not having pages like contact, privacy, tos. These are some of the reason why your blog has been disapproved. GulmiResunga.com: Earn 30400 per Month:Qualification SLC and above: Believe It or Not!